You and I know them as 'varactor diodes,' but originally the semiconductor junctions whose reverse bias determines its capacitance was called the 'Varicap.' The new and wondrous semiconductor craze was in full swing by 1958. Scientists, engineers, and hobbyists were burning the midnight oil (to use a popular phrase of the day) performing experiments and designing circuits to replace vacuum tubes and manual controls with transistors and other electrically variable semiconductors. The Varicap had the ability to tune receiver and transmitter oscillators and filters without the need for high tube bias voltages and large mechanically variable multi-plate capacitors. 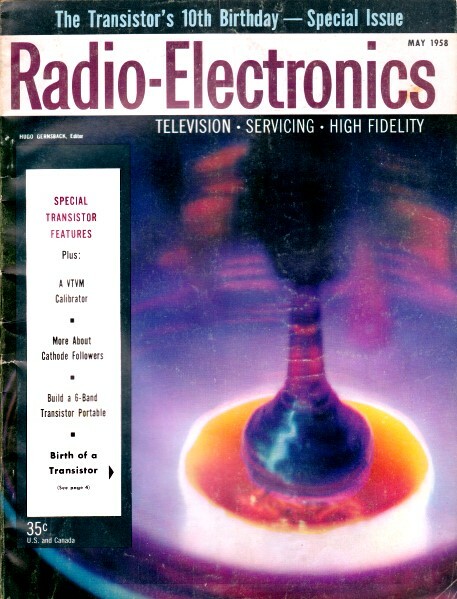 This article from Radio-Electronics says early Varicaps cost $4.50 apiece ($36.91 in 2014 dollars per the BLS Inflation Calculator), so they were not cheap by any account. However, their cost was justified by reducing circuit complication (a mechanically variable capacitor and possibly a vacuum tube), improving reliability (no moving parts to wear out, vibration immunity, resistance to environmental factors), and the prestige of claiming to be a modern 'electronically tuned' product. The capacitance of this startling little semiconductor, the size of a 1/4-watt resistor, varies with he voltage applied to it. The capacitance of a reverse-biased semiconductor junction varies with the reverse dc voltage-capacitance decreases as voltage is increased. This effect has been noted in both diodes and power rectifiers. In selenium rectifier plates, for example, the capacitance is comparatively large, often reaching 0.25 μ.f or more. Attempts to use this voltage-sensitive capacitance have been thwarted by the comparatively low reverse resistance of the junction - rather high currents are needed to effect the capacitance changes, and the Q is too low for most practical applications. Also, both the capacitance and reverse resistance are extremely temperature-sensitive in ordinary diodes and rectifiers. 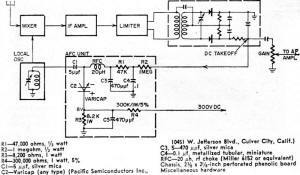 An important milestone was reached with development of the silicon junction diode. This semiconductor device has capacitance in small but useful amounts readily varied by the reverse bias. And the reverse resistance of the silicon p-n junction is so high (often 10,000 megohms at -1 volt) that almost no current at all is required to do the job. Essentially a high-Q component, the silicon junction is noted for the stability of its capacitance over a wide temperature range. In research laboratories during the past 2 years, the voltage-sensitive capacitance of the silicon p-n junction has been used in experimental voltage-operated tuning, frequency modulators, automatic frequency control, capacitor type amplifiers, tunable filters and numerous sensitive remote-control devices. Workers who had been intrigued by the earlier dielectric amplifier (using voltage-sensitive ceramic capacitors), only to be frustrated by their severe temperature drift, have had their interest re-stimulated by the silicon junction. 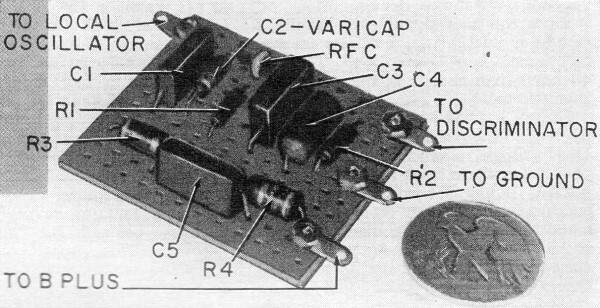 Now, a useful new semiconductor component, the Varicap (see Radio-Electronics, January, 1958, page 45) has become commercially available. This simple, two-terminal, p-n junction device, designed for use as a voltage-variable capacitor, opens new vistas for the simplification of many electronic circuits. The number of applications to old circuits and the possibilities for new circuits will be limited only by the experimenter's imagination and ingenuity. No larger than most 1/4-watt resistors and resembling a miniature crystal diode, the Varicap will do the work of a reactance modulator tube or of a variable capacitor, both of which are many times its size. A miniature tuning capacitor and reactance tube dwarf Varicap which may replace them. AFC circuit which you can add to FM receiver fits on 2 1/8 x 2 3/8-inch Phenolic board. Fig. 1 - Schematic symbol and equivalent circuit of the Varicap. Fig. 2 - How Varicap capacitance varies with bias voltage. Fig. 3 - Test setup to demonstrate Varicap performance. Fig. 1 shows the schematic symbol and equivalent circuit of the Varicap. The markings in Fig. 1-a indicate the dc bias voltage polarity. The positive end of the unit is marked with a painted black band. Fig. 1-b shows the equivalent circuit. 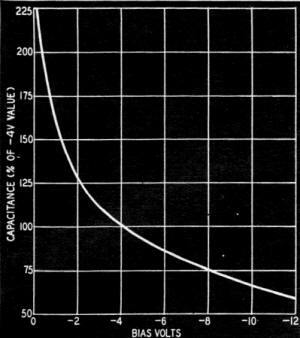 Capacitance C varies approximately as 1/√V, where V is the reverse bias voltage, and is practically constant (for any given value of V) from -65°C to 150°C. Both capacitance and the series resistance Rs) are substantially independent of the operating frequency. The maximum frequency at which the equivalent circuit remains as shown in Fig. 1-b is 500 mc. Varicaps are available in six capacitances, as shown in the chart. These capacitances are obtained with a dc bias of -4 volts. Capacitance tolerance is ± 20%. A Varicap costs about $4.50. Fig. 2 shows the capacitance variation with reverse dc bias voltage. This curve applies to all types of Varicaps, regardless of their nominal capacitance, and shows that each has 100% of the rated capacitance when the bias is -4 volts. Only a few millimicroamperes of current flow when bias is applied to the Varicap. 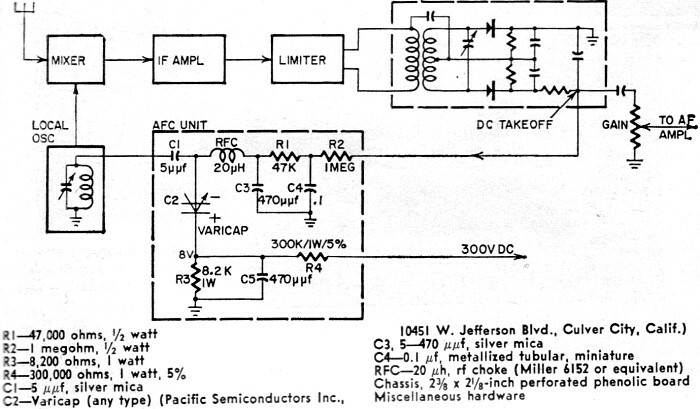 Thus, virtually no power is required to vary the capacitance of this very-high-resistance device. Since the bias signal may be either steady or fluctuating, a variety of control signals may be employed. The frequency range extends from dc to more than 500 mc. In any application, the total voltage applied to the Varicap (that is, the dc bias voltage plus the signal-voltage peak when there is an alternating component) must not exceed the unit's maximum operating voltage. Also, since the Varicap is a diode operated in the reverse direction, the dc bias voltage should not be set so low that the signal-voltage peak will swing operation into the forward, or conducting, region. In a conventional capacitor, a small leakage current flows through the dielectric because it is not a perfect insulator. The higher the insulation resistance, the lower this current. In a mica capacitor in good condition, dielectric resistance may be 100,000 megohms or more, and the leakage current at low dc voltages so tiny that it can be ignored completely. In a tubular paper capacitor, the dielectric resistance may be as low as 1,000 megohms; therefore leakage current is much higher than in a mica unit. The leakage current is highest of all in an electrolytic capacitor; it may be an appreciable part of a milliampere. Because of leakage current, the equivalent circuit of a capacitor shows a leakage resistance in parallel with the capacitor plates. The leakage resistance is so high in a mica capacitor that its shunting effect is negligible. The dielectric between the plates approaching a perfect insulator, there is (to all practical intents and purposes) no appreciable leakage path between the plates, and the parallel resistance may be erased from the equivalent circuit. Similarly, in the Varicap, the leakage resistance is extremely high (in the order of tens of thousands of megohms) since the reverse-biased silicon p-n junction passes only a few thousandths of a microampere. As in the mica capacitor, the parallel resistance may be ignored and the junction considered a capaci­tance, since its reactance is many or­ders of magnitude lower than the shunting resistance. The situation is much the same as having a very good dielectric between the "plates" of the junction. This capacitance varies, as explained earlier, with the impressed dc reverse voltage. A conventional capacitor also has a series resistance component Rs. At high frequencies, the magnitude of this resistance is due to the resistance of plates, leads and various in-phase components of current. The Q of the capacitor is affected by this series resistance. The Varicap also has an Rs component. It is shown in Fig. 1-b and is specified for each type in the chart. The Q of the Varicap (but not its capacitance) similarly depends upon this series component. As mentioned earlier, however, this series resistance component is independent of frequency up to 500 mc. It is well to reflect that other semiconductor junctions, such as germanium diodes and selenium rectifiers, pass much higher reverse (leakage) currents. These leakages are not only higher than those of high-quality silicon junctions but increase markedly with increased reverse voltage. In these units, because the leakage resistance is often of the same order of magnitude or even lower than the capacitive reactance, the useful change produced by changing the voltage on these devices is not exclusively a capacitance change but rather a change in the impedance of the equivalent R-C circuit. In this respect, the selenium rectifier somewhat resembles the electrolytic capacitor with its high leakage. Quite to the contrary, the extremely high leakage resistance of the silicon p-n junction and its useful capacitance identify it as a high-quality capacitor. One of the first applications that comes to mind is use of the Varicap as a voltage-variable tuning capacitor in an L-C circuit. Fig. 3 shows the author's test setup to demonstrate this effect and to check the tuning range for one set of operating conditions. In this arrangement, C2 is a type V56 Varicap which serves as the tuning capacitor of the L-C circuit, L2-C2. Capacitor C1 blocks direct current flow from the coil. This capacitance is very large with respect to C2. Adjustable dc bias is supplied by a battery through potentiometer R2. The bias level is indicated by the dc voltmeter. Isolating resistor R1 blocks rf flow into the dc circuit but introduces no appreciable dc voltage drop because of the negligible direct current flowing through the Varicap. An rf choke can be used in place of R1. The rf vtvm acts as a high-impedance resonance indicator. The test signal is supplied by a conventional rf signal generator link-coupled to the L-C circuit through coil L1. Coil L2 has been wound for resonance with C2 in the vicinity of 2 mc. Near zero dc voltage, the Varicap has its highest capacitance (nominally greater than 100 μμf) and the L-C circuit therefore is tuned to its lowest frequency. At -9 volts, the capacitance is low (approximately 39 μμf) and the circuit is tuned to its highest frequency. To keep within operating ratings of the Varicap, the dc voltage should not be set to less than 1, nor the rf voltage, indicated by the vtvm, to more than 0.5 volt rms. To demonstrate the effectiveness of the Varicap as a voltage-variable tuning capacitor: (1) Set the dc voltage to -1. (2) Tune the rf signal generator for resonance, as indicated by peak deflection of the vtvm. Set the generator output control to hold this deflection to 0.5-volt rms. (3) Record the generator frequency as f1. (4) Set the dc voltage to -9, noting that the vtvm deflection falls indicating detuning of the circuit. (5) Retune the generator to locate the new, higher resonant frequency and record this as f2, The tuning range afforded by the 8-volt bias change is equal to f2 - f1. In the test setup shown in Fig.3, the circuit was tuned from 1400 kc at -1 volt to 2250 kc at -9 volts, a tuning range of 850 kc. A wide frequency band may be covered with the same capacitance change if L2's inductance is made smaller to increase the operating frequency. In some applications of this principle, it will be desirable to use the Varicap as a voltage-variable trimmer in parallel with an air tuning capacitor. Many applications of this principle suggest themselves. Examples are the voltage tuning of rf test oscillators, local oscillators in radio and TV receivers (especially in remote control operation), self-excited oscillators in transmitters and absorption wave-meters. Fig. 4 - Varicap frequency modulator circuit. Fig. 5 - A Varicap AFC circuit for your FM receiver. 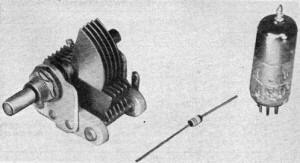 In the experimental circuit shown in Fig. 4, the Varicap (C2) is shunted (through .01-μf blocking capacitor C3) across the tank circuit (L-C4) of a self-excited 50-mc oscillator. An audio-frequency voltage (af) is applied to the Varicap in series with the 6-volt dc bias supplied by the battery. This ac fluctuates the bias at the audio-frequency rate. The capacitance of the Varicap accordingly fluctuates about its mean -6-volt value, frequency-modulating the oscillator. The center frequency is determined by the setting of the 100-μμf air capacitor (C4) and the -6-volt bias level. Sweep width is proportional to the amplitude of Eaf and is adjusted by varying this audio voltage. In Fig. 4, the rf oscillator is tuned to the center frequency of 50 mc when C-4 is set to 50 μμf, the dc bias to -6 volts and Eaf to zero. A 0- to 4-mc sweep is obtained when Eaf is varied from 0 to 1.5 volts rms. To prevent exceeding the Varicap voltage ratings in this kind of FM oscillator, the sum of the dc, peak af and peak rf voltages must not exceed the maximum voltage shown in the chart. Also, the dc bias must not be set so low that the sum of Eaf peak and Erf peak will drive the Varicap into its forward, or conducting, region, In Fig. 5, these conditions are met when Edc = -6 volts, Eaf does not exceed 1.5 volts rms and Erf does not exceed 3 volts. While the latter is a relatively low rf tank voltage for tube type oscillators, it is reasonable for high-frequency transistor oscillators with which the Varicap frequency modulator is a natural companion. Although the tank circuit shown in Fig, 4 has been designed for 50-mc operation, it is not imperative that this frequency be used. The same FM scheme may be used at other center frequencies by properly proportioning the L-C circuit. The lower the center frequency, the lower the sweep width obtained with a given Varicap capacitance swing, and vice versa, The transformer shown in Fig. 4 is not critical. Any audio unit whose secondary will deliver a maximum of 1.5 volts rms audio from a given af source is usable if it has a satisfactory audio response. The voltage-variable capacitance of the Varicap and its temperature stability suit it for use as a simple, highly sensitive, afc device which performs better than some reactance tube circuits. The small size of an afc unit, containing a Varicap, four small capacitors, four resistors and an rf choke, lets you tuck it into a receiver with a minimum of disturbance to the set's circuitry. This should be welcome news to hi-fi enthusiasts whose FM receivers have no automatic frequency control. Fig. 5 shows an afc circuit developed by Pacific Semiconductor engineers, which I adapted for bias from the 300-volt dc supply of an FM receiver. The photos show the complete unit ready for wiring into the receiver. Any type of Varicap may be used. The receiver's local oscillator is simply realigned to compensate for the shunting capacitance introduced by the biased Varicap C2 which functions as a frequency-controlled trimmer across the local oscillator tank. The Varicap is referred to a dc bias of -8 volts obtained from the receiver's 300-volt supply through the voltage divider R3, R4. The afc dc voltage is obtained from one side of the discriminator. For other than 300-volt supplies, the values of R3 and R4 will not be the same as mine but must be worked out for an output of -8 volts from the particular supply voltage of the set that you are adding this afc circuit to. The completed afc unit is built on a perforated phenolic board 2 3/8 inches long and 2 1/8 inches wide. The pigtails of the components are passed through the holes in the board and interconnected underneath to complete the wiring. Printed circuitry may be used. The four connections to the receiver circuit are made at solder lugs mounted along the edge of the panel. The completed unit should be mounted as close as possible to the local oscillator so that the lead from the tank to C1 will be short. Other suggested uses for the Varicap include all-electronic dc-to-dc and dc-to-ac choppers, amplitude modulators, alignment sweep generators, capacitor type amplifiers (both ac and dc) , ac type flip-flops, automatic amplitude control in f oscillators, FM telemetering and elimination of the fine-tuning control in TV receivers. In some applications, Varicaps, like capacitors, may be operated in parallel for increased capacitance and in series back to back for increased voltage-handling capability. 1 William Shockley, Electrons and Holes in Semiconductors, D. Van Nostrand Co., 1950, page 100. 2 D. C. Brown and F. Henderson. "The PN Junction on a Variable Reactance Device for FM Production,"
Electronic Engineering, (London) November, 1957, page 556.